Breeding peafowl is rewarding, but can be frustrating if you get a poor hatch rate! A single peacock will breed with up to five peahens, this is called a harem. A group of peafowl is called a muster. Care must be taken with free ranging peafowl to see which peacocks are fertile and which peacocks are mating to ensure inbreeding does not occur. when inbred peachicks can hatch with deformities in their feet, legs and eyes. The peacocks with the longest most impressive tails will be seen by the peahens as the most fertile. Peahens will ignore a younger male with a shorter tail. He does not stand a chance. Charles Darwin did some research which proved that the males with the most ocelli would be the most successful breeders. 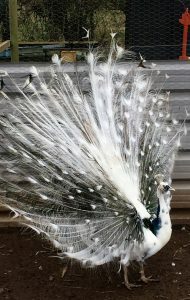 The peacock will display his tail, dance and strut for the peahens who will casually walk past the peacocks until they are ready to mate. Then it is a quick run and pounce. The male is too lazy to run very far so they wait for the peahen to walk in front of them while displaying. When breeding peafowl the peahens will lay an egg every other day in clutches throughout the breeding period of March to August dependant on the weather. If it is a mild winter and a warm spring the peafowl can start breeding earlier in the season than usual. We have had the peacocks start calling in February! The peafowl eggs are smaller than a goose egg and larger than a chicken egg. Around the size o a turkey egg. When breeding peafowl remove the eggs regularly so the peahens will continue laying in cycles . The peahens will lay an egg every other day having a break of 10-14 days before starting to lay again. They can lay up to three cycles during the season. When selecting birds for breeding it is important to remember that not all colours and peafowl varieties breed true. In the UK we have very limited breeding stock for the rare breeds. Breeding peafowl should be unrelated. In USA while establishing the breed Cameo peafowl were continually inbred. Consequently some cameo peafowl were born blind or developed blindness as they matured. At Peacocks UK we take our responsibility with the rare breeds of peafowl we imported into the UK very seriously. We establish three separate blood lines for each breed. We frequently breed Indian blue peahens into the rare breeds lines to keep the stock strong and disease free. At Peacocks UK we know the male parentage of each peachick. We rotate the peahens through the peacocks each year. This ensures that inbreeding of the peafowl does not occur. Breeding peafowl is lovely watching the chicks develop into mature birds, creating the next generation and establishing new varieties of peafowl within the UK.